So many of the great pianists and teachers have come out of Poland and Russia (Rubinstein, Anton as well as Arthur, Leschetizky, Paderewski, the Lhevinnes, Gilels, Richter, and others), yet we know little about their methods of learning and teaching. 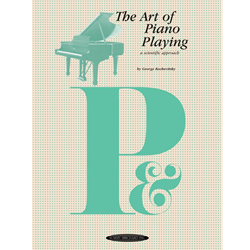 George Kochevitsky in The Art of Piano Playing supplies some important sources of information previously unavailable in this country. Russian sources alone occupy four columns of his bibliography on 'History and Theory of Pianism.' Additionally there are six columns of German sources and seven columns of sources in English. From these sources, tempered by this own thinking, Kochevitsky has formulated a scientific approach that can solve most problems of piano playing and teaching. George Kochevitsky graduated in 1930 from Leningrad Conservatory and did post-graduate work at Moscow Conservatory. Coming to the U.S., he has taught privately in New York City, given a number of lectures, and written for various music periodicals.